How EU agencies affect our lives – for the better! The EU referendum “leave” campaign spread the idea that our lives were increasingly falling under the dark influence of unaccountable and overpaid “bureaucrats in Brussels”. This conjured up a picture of hordes of faceless, most likely foreign, people in cavernous offices, beavering away to generate more and more ridiculous regulations through which to control the way we live. We were urged to “take back control”. My first reaction was to ask myself whether my own life had been negatively affected by any EU laws or regulations, and I still cannot point to any instance. I suspect most readers, except perhaps some farmers and certainly a lot of fishermen, will come to the same conclusion. It also struck me that it comes naturally to many people who value their independence to complain about rules and regulations and to blame the people who impose them. But think what would happen to international football if each country was to play by its own rules and to drop umpires from matches. Consensually agreed standards and rules are vital to assure fair play between countries, and they lead to fewer disputes and, in most cases, huge efficiency benefits; they also tend to protect the weak from exploitation. Excessive regulation, however, can fuel resistance and create bureaucratic hurdles. So rather than instinctively scoff at the work of “Brussels bureaucrats”, we must also look at the other side of the coin, exploring what benefits we gain from the work of the European Commission and a selection of its over 40 specialised agencies. Although the EU runs programmes that touch almost every important aspect of our lives in generally positive ways, the level of public awareness about them us extremely low. In spite of the focus of British political attention on the EU over the past year, I suspect that few UK voters could even name more than one or two of the Union’s agencies, still less be aware of how their work impacts on us. Two EU agencies, the European Medicines Agency (EMA) and the European Banking Authority(EBA) are located in London. 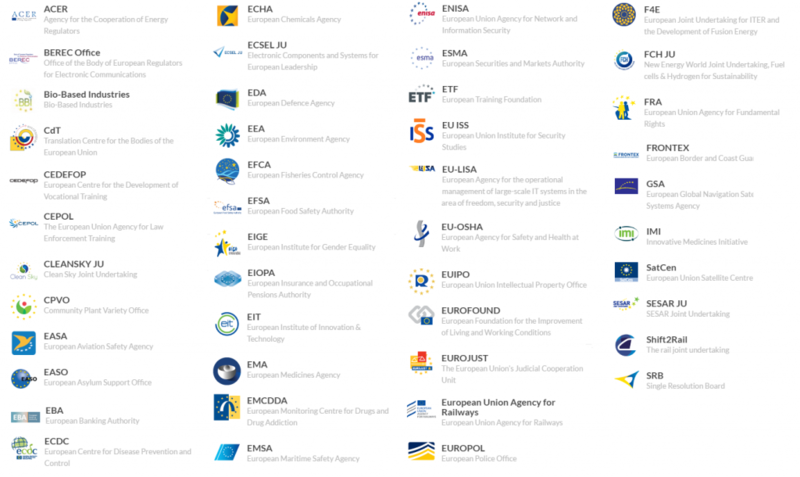 Most of the specialised EU agencies, including the EMA (created in 1995), serve as hubs which promote collaboration between national institutions which work in similar fields at country level. Often joint work starts with sharing of information and identifying best practises, but it may lead to setting common standards and to adopting shared initiatives on priority and emerging themes. The EMA, for example, beyond approval of medicines for human and animal use throughout Europe, is leading the development of new strategies to minimize the rising threat of resistance to antibiotics, including through excessive use of antimicrobials in livestock farming and in pets. Work such as this, conducted with the full engagement of national specialists from the EU’s 28 countries, can do much to improve our health and life expectancy prospects. The main goal of many EU agencies is to harmonize standards applying to their respective sectors across the EU. This can bring big efficiency gains and cost savings, and, in some fields, protect consumers from damage caused by poor practices. The EBA falls within this category. It was founded at the height of the banking crisis in 2011 with the main goal of harmonizing rules on risk exposure of financial institutions operating in the EU, setting “Binding Technical Standards” for accounting, reporting and supervision procedures. The aim is to arrive at a “Single Rulebook” for the financial sector. Once in place, this should not only reduce fraud and malpractice but also lead to increased protection of our savings. Had it existed 10 years ago, perhaps the UK government would not have had to fork out £37 billion of taxpayer money on 13th October 2008 to rescue RBS, HBOS and Lloyds/TSB from failure! Many of the agencies address issues that, by their nature, transcend national boundaries and can be most effectively tackled by coordinated action between countries This, of course, applies to many environmental problems and led to the foundation in 1993 of the European Environment Agency (EEA), located in Denmark. The EEA’s role is to generate sound, independent information on the changing state of the environment, including air pollution, climate change, nature (water, soils etc.) and sustainability. Sectoral focus areas include agriculture, energy, industry and transport. Its work has informed European environmental policy-making, leading to the region now having some of the most advanced environmental management programmes in the world. There are worrying signs that, if Britain withdraws from the EU, it might, under private sector pressure, become prone to compromising on environmental policies to gain commercial advantages. The safe and efficient movement of people also transcends borders – for instance through setting high standards for the safety of air travel in Europe (European Air Safety Agency – EASA), the use of mobile phones when you move between countries (Body of European Regulators of Electronic Communications – BEREC), or tracking criminals and sharing information on organized crime throughout Europe (EUROPOL). Other agencies manage projects, such as in space exploration (European Global Navigation Satellite Systems Agency – GSA), that are too big or too complex to be handled by single nations working alone or by the private sector. Some agencies add efficiency and scale to ongoing national efforts by funding inter-country collaboration on common priority themes and reducing duplication. By far the largest example of this is the Horizon 2020 programme that supports scientific research and innovation, funded to the tune of £63 billion over 7 years by the European Research Council and managed by its Research Executive Agency (REA). The UK has been the biggest recipient so far of research and innovation grants under Horizon 2020, with annual inflows of over £1 billion per year. Our overall message is that Britain is not only an important contributor to the work of these agencies but that each of us benefits – often without knowing it – from their activities. The agencies do not substitute for the important work undertaken by national institutions but reinforce this especially by harmonizing processes, cutting duplication, sharing information and promoting collaboration. The agencies’ programmes are shaped not by faceless bureaucrats but through deep consultation with all interested parties before submitting for approval of the European parliament. It is also evident that many of the agencies are well placed to respond to emerging issues that can have deep impacts on the lives of all people living in the European Union – whether the spread of new human or livestock diseases, the threats posed by climate change or means of reducing the risks of terrorist attacks. They also allow European countries to speak with one voice – and therefore carry more weight – in global consultations and policy making. Voters need to be aware that, if Britain withdraws from the EU, it risks losing its membership of all of these agencies – not only diminishing its influence on their programmes and policies but also weakening their effectiveness by opting out of their programmes. This article was first published on the “Future of Our Children” campaign website. Re-posted with permission.